Stay in this unique and comfortable designer harbour home in Uitwellingerga for 8 people. 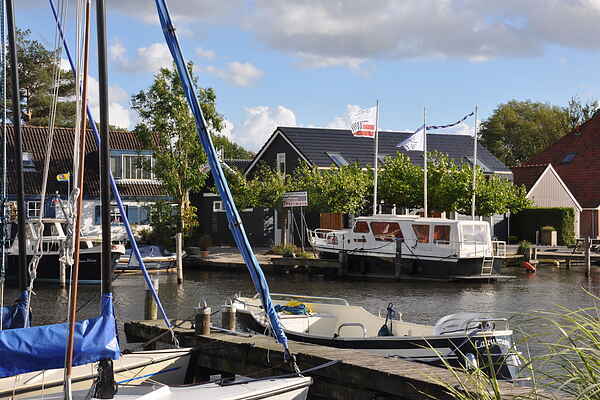 The holiday home consists of two identical apartments, each with their own style and each with direct access the open water to the Sneekermeer and with that access to the whole Frisian Lake region! If you want to rent a sailboat or sloop (6 or 10 persons) please contact the owner in time for the possibilities. The two apartments are not internally connected but linked by a large sun terrace and mooring (not enclosed). This makes the home ideal for two families or couples who want to spend their holiday together but also like their privacy. The apartments and much of the furniture and accessories in the harbour home are designed by Yn Twelle and are for sale. A conference/workshop room is located behind the harbour home. The owners can organise catering, boot trips, and creative workshops for you! Uitwellingerga is situated between Sneek and Joure. It is easily and quickly accessible from the A7 motorway. Sneek is one of the eleven Frisian Cities and boasts a friendly and complete shopping centre. The apartments are an ideal base for an active sailing or boating holiday or just for a quiet weekend or short break away. You can hire bicycles directly from the owner! *Note! Pets are only welcome in one of the apartments. We strongly believe in sustainable solutions. Therefore we make use of geothermal heath and have a solar panel installation for ca. 15.000 kWh, and an electrical car. The De Lytse Ooster-Haven has a charging unit for electric or Plug-In vehicles: ICU Eve mini 11 kW Plug & Charge met Socket & Display (Type 2 sockets). The system is plug-and charge, so no passes necessary. Please, just note the usage of electricity. We’ll charge you woth EUR 0,25 per kWh. You can adress your need to use the charging system with Koos or Regina and we’ll make it available for you. If necessary we can also find the amount of kWh on the display in our house.